With a rich and chequered history closely linked to Brisbane’s penal colony origins, Burnett Lane is the first narrow CBD road to undergo transformation as part of Brisbane City Council’s “Vibrant Laneway” program. In former days the lane played host to convict barracks, Stewart’s Ales, a post office, Queensland’s first Methodist Church and numerous businesses. For a three-month trial period, the Albert Street access road is restricted to pedestrian traffic between 11am and 2pm on weekdays. The council provides plastic tables, chairs and umbrellas set on artificial grass to help create a lively street atmosphere. There is music, the Record and CD Exchange displays wares, books are traded and a corner coffee cart serves to encourage patronage of the space. Take a journey up the revamped lane and discover creative designs and interesting finds among garbage bins, skips, delivery vehicles and (police) parking! 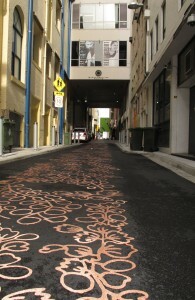 Renowned Australian artist Elizabeth Woods designed the artwork uniquely imprinted in the newly-laid asphalt. This intriguing, cinnamon-coloured plant-motif street print gradually morphs into a luminescent lime-green as one nears George Street and pays homage to the work of lane namesake, surveyor James Charles Burnett. 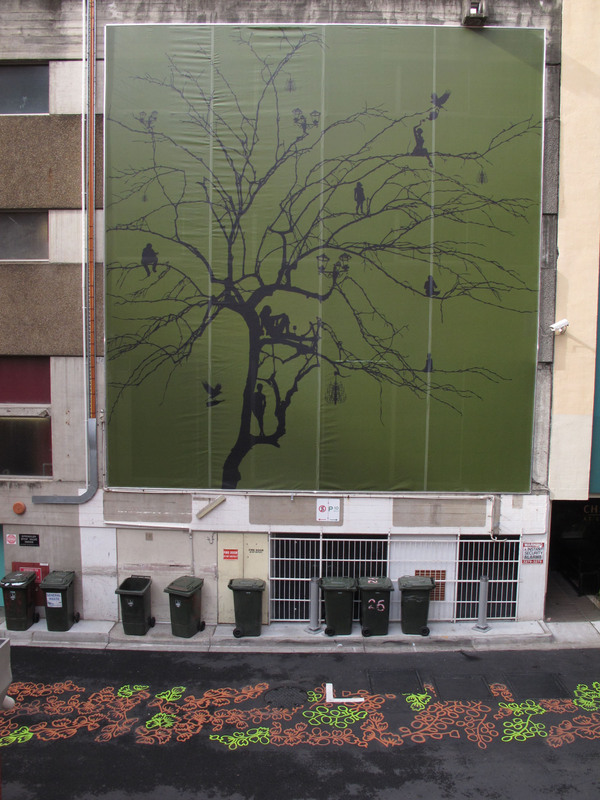 On the left, after the Queen Adelaide building overhang, Brisbane-based visual artist Natalie Billing has immortalised facets of Burnett’s life in elaborate text work. Beneath a silhouette, stencilled plastic and painted scripts enliven a plastered wall and cover a roll-up garage door. According to the Moreton Bay Courier of 22 July, 1854, Burnett died “debilitated” at the age of 39, the result of “an enthusiastic and almost reckless devotion to the trying duties of his profession”. 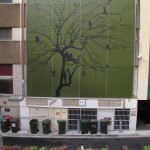 Next to the Chifley Hotel drop-off zone hangs the massive artwork “The Green Wall” by Brisbane artist Simon Suckling. A council spokesperson speaking on the artist’s behalf said the work “represents the growth of the laneway as it blossoms into life”. Printed on verdant green PVC perforated vinyl mesh, it almost covers the rear of 84 Queen Street. The impressive piece depicts a perfectly proportioned tree silhouette, its bare boughs decorated with whimsical profiles of seven figures, coach lamps and chandeliers. Two birds fly in, one carrying a wine bottle while the second pours tea for a female figure seated at the top of the tree. Opposite The Green Wall is a narrow, industrial stairway marked with a small sign declaring CITY STUDIOS; the rudimentary redbrick wall has a large, red, neon ‘Love’ sign placed between a really big, fringed maroon lampshade and a sign proclaiming “Open 24 Hours”. Heath Williamson of Firefly Lighting did the lane’s colourful neon signage. At the top of the stairway is the back entrance to City Studios. A project of Social Futures Initiative, a not-for- profit organisation with a strong community-based ethos, the studios were co-founded by architectural master’s student Jeremy Gilmore. They offer an innovative concept in affordable city desk space aimed at providing facilities and services to the creative community. Operational for about three months, architects and other creatives use the lively, warehouse-like loft space. There are plans underway to increase the space available to people needing centrally located, affordable, city desk space. And situated above JB Hi-Fi and accessible from Adelaide Street, the first floor will provide an upmarket, studio environment for permanent desk space. There are plans afoot to offer space for users who require “hot desk” space for limited and flexible periods. The hip and happening City Studios have been involved with the revitalisation of the Lane and ran Glow 32, a space used in collaboration with council’s Inhabit Fiesta, to host art exhibitions, installations and gigs at 32 Burnett Lane. Whether the council succeeds in establishing the lane as a permanent Melbourne-type inner city lane, with bar/coffee shop/ restaurant space remains to be seen. Burnett runs parallel to busy Queen Street Mall whose retailers pay top dollar for their quarters. But hey, take a walk; the lane is well worth the visit.